Looking at the external finish of the VUE h15 gives you a pretty good idea of the build quality within, and lifting the speaker up should pretty rapidly confirm your theory. Or if you wanted to do things the easy way, you could always just plug it in and have a listen. h-Class is the flagship range of point source speaker systems by VUE Audiotechnik, and the h15s are about the biggest full range boxes in the series (the subwoofers are bigger). The h15 is available in two variations – the h15N (narrow) and the h15W (wide). Physically and electronically the two are very similar, the key point of difference being the nominal coverage angles – the wide is 100×50 degrees while the narrow model is 60×40 degrees (HxV). We reviewed the narrow model. You won’t find a top-hat for pole mounting the h15, and with the box weighing just over 40kg this is perhaps a deliberate move to prevent users injuring themselves or using under-rated stands. You will find plenty of M10 fly points allowing for neat permanent installation, as well as a nice pair of well positioned carry handles. The handles and the front grille are nominally black, but there’s an ever-so-slight sheen of candy apple red beneath the black. I’m not sure how many coats of paint they apply at the factory, but I suspect it’s more than one. Low end response in the h15 is controlled by a 15” paper cone woofer with 4” voice coil, and 830W RMS of amplification (measured with long-term sine wave before protection). At 4” the HF voicecoil is certainly no toy, and it’s connected at one end to 275W RMS of amplification, and to a Truextent™ Beryllium diaphragm at the other (okay, so technically the amp connection is at the side of the voicecoil, but let’s not ruin the poetry of it all okay?). The Beryllium diaphragm was one of the big points of difference VUE brought to the market at its inception, and the idea is that because it provides a better stiffness to mass ratio, HF response of the driver is both more efficient and less susceptible to breakup. More on the practicalities of this later. VUE h-Class must have one of the most comprehensive electronics modules of any self-powered speaker I’ve ever seen. There is no mic level input or potentiometer to adjust levels, and indeed the market into which speakers like this are destined to be sold is for the most part a bit beyond plugging a mic into a speaker. What you do get is analogue and AES inputs on XLR (both with loop outputs), plus an etherCON connection for control and Dante input. powerCON input with loop out, and a dazzling array of status LEDs complete the back panel. The only rear panel control per se is a recessed “DSP reset” button, which takes the speaker back to its default settings. How you make it deviate from those defaults is through SystemVUE. 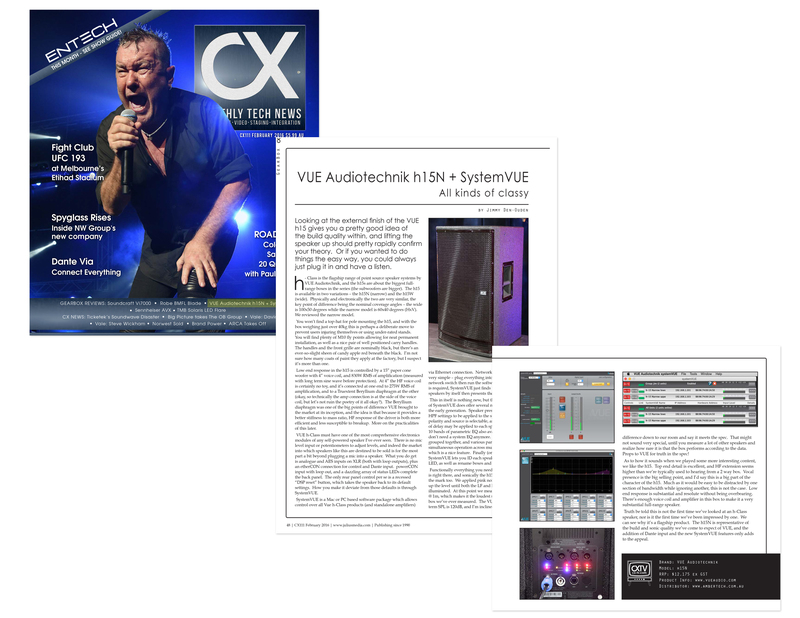 SystemVUE is a Mac or PC based software package which allows control over all Vue h-Class products (and standalone amplifiers) via Ethernet connection. Network topology is very simple – plug everything into some kind of network switch then run the software. No IP config is required, SystemVUE just finds the connected speakers by itself then presents them in a list. This in itself is nothing new, but the latest version of SystemVUE does offer several new features over the early generation. Speaker presets allow various HPF settings to be applied to the speaker, input level, polarity and source is selectable, and up to 2000mS of delay may be applied to each speaker. Now with 10 bands of parametric EQ also available, you almost don’t need a system EQ anymore. Speakers may be grouped together, and various parameters linked for simultaneous operation across multiple speakers too, which is a nice feature. Finally (or perhaps initially), SystemVUE lets you ID each speaker by flashing its LED, as well as rename boxes and put them to sleep. Functionally everything you need from a speaker is right there, and sonically the h15 certainly hits the mark too. We applied pink noise and dialed up the level until both the LF and HF limiter LEDs illuminated. At this point we measured 119.1dBA @ 1m, which makes it the loudest single speaker box we’ve ever measured. The VUE spec for longterm SPL is 120dB, and I’m inclined to put the 0.9dB difference down to our room and say it meets the spec. That might not sound very special, until you measure a lot of other speakers and realize how rare it is that the box performs according to the data. Props to VUE for truth in the spec! As to how it sounds when we played some more interesting content, we like the h15. Top end detail is excellent, and HF extension seems higher than we’re typically used to hearing from a 2 way box. Vocal presence is the big selling point, and I’d say this is a big part of the character of the h15. Much as it would be easy to be distracted by one section of bandwidth while ignoring another, this is not the case. Low end response is substantial and resolute without being overbearing. There’s enough voice coil and amplifier in this box to make it a very substantial full-range speaker. Truth be told this is not the first time we’ve looked at an h-Class speaker, nor is it the first time we’ve been impressed by one. We can see why it’s a flagship product. The h15N is representative of the build and sonic quality we’ve come to expect of VUE, and the addition of Dante input and the new SystemVUE features only adds to the appeal.